Soon International Women’s Day will be upon us. Time to start blogging and showcasing amazing female artists who inspire me. I first ran into her work on a trip to the UK. 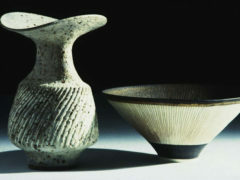 Lucie Rie fled Nazi Vienna in 1938 for London. Read this amazing article on Lucie Rei at craft and culture’s blog. Not only a pioneer in ceramics but a courageous woman who fled Vienna as it could be toxic for a young woman in the arts. She was direct and would not be silenced, self-confident but did not grandstand. Her sense of objects of beauty surrounding your world was a design conscious standard in her work. She was born March 16 1902. 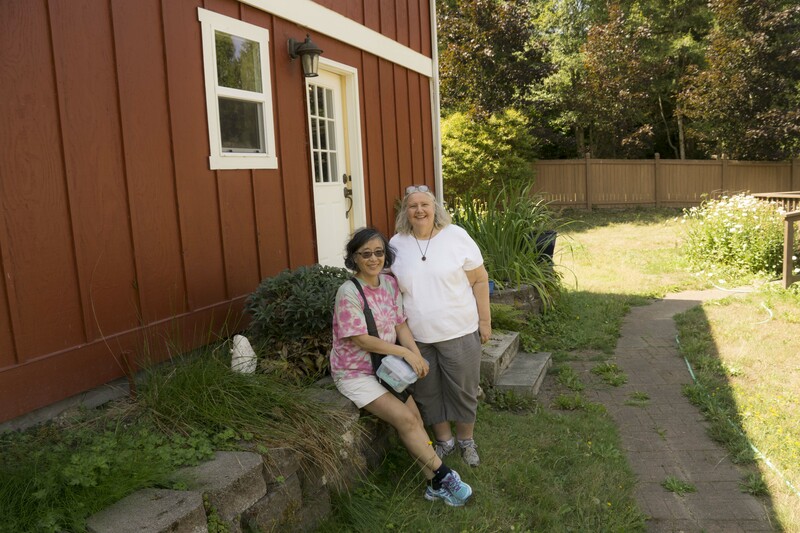 I get to hang out occasionally with a water color artist and illustrator who is a member of the American Society of Botanical Artists https://www.asba-art.org and the Pacific Northwest Botanical Artists https://www.pnba and Kathleen’s work is posted this month in http://www.pnba-artists.com. I recently joined this organization to have my drawings inform my sculpture. My next project is a butterfly and red flower. More posts once I have drawn my specimen onto paper. I love how the photographer Andrew Lageras captured the butterfly with direct and indirect lighting shows both the blue and green coloration of this species under light and shadow. 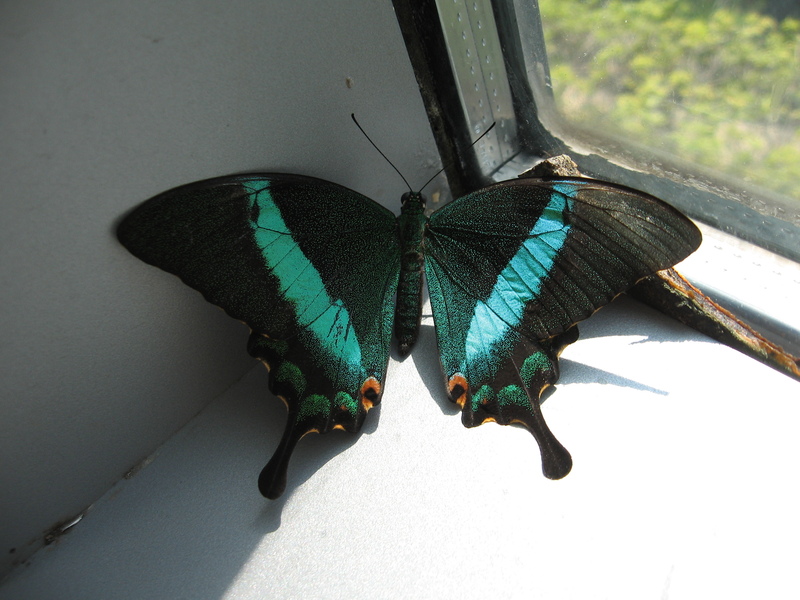 I will have a specimen of this butterfly to study for the drawing so there might be variations to the final piece. Got a message that Terry was coming up my way to Seattle meeting up with friends from SF to Seattle. Terry is a delightful artist from California her website is http://glassart.weebly.com/portraits.html portraits that remind me of the colors of Hundertwasser, the flavor of Seated Woman by William de Kooning and the fun found in Paul Klee’s work with a splash of Picasso’s portraits thrown into the mix. Check it out she’s a fun and talented lady. I adore her portraits in fused glass with lamp worked elements were she takes a line out for a walk. We hadn’t seen one another for years. We were at Red Deer together playing in glass of course; but it was as if it was just last week that we’d last seen each other. Got a demo of how to use my new torch and explore the limits of it’s capacity. More toys needed of course but had a delightful time sharing ideas, catching up and having lunch. Looking forward to another visit and hope you enjoy time in our area on your family holiday. Thank your husband and children for letting me steal a bit of your time! You can tell an artist is dedicated to supporting their friends and the arts by how long they’ll wait (2 hours) to get into Seattle. 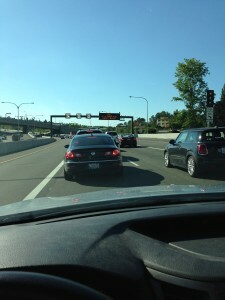 Myself and 1000 of my friends on the 520 for 1st Thursday. Doug, it looks like they’re all beating me to your opening. For those that exited off due to the madness check out http://www.vetriglass.com/category/25670478941/1/Doug-Randall.htm. I also had time to check out Ethan Stern and Einar and Jamex De La Torre at http://www.travergallery.com Ethan’s new body of work was stunning and the De La Torre work was political, optically fascinating and they were a delight to meet. August there are several great show. Nathan Vincent: Let’s Play War! September is Counter-Couture, can’t wait should be fun! If you’re an employee check out my work in Issaquah or attend an event by signing up the next Talk isn’t listed on the website but also check out their facebook page. Aug 15 – Fresh Paint the lovely work of Aikio Vail and Paul her husband is work to check out!! Summer Moments is ending soon, art and sculpture abound here and is a must see. Open weekends so plan your trip or get your stone carving on at a workshop. – Billabong Dreams til June 19, 2016. 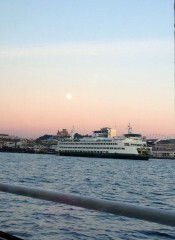 Lots to do in Tacoma. I went down for a trip to TAM and MOG and like a lame brain I didn’t think either would be closed on Monday. Boy was I wrong. I wanted to catch the Aloha Club Collection http://www.tacomaartmuseum.org/explore/exhibitions/ but will need to go back to see this one. 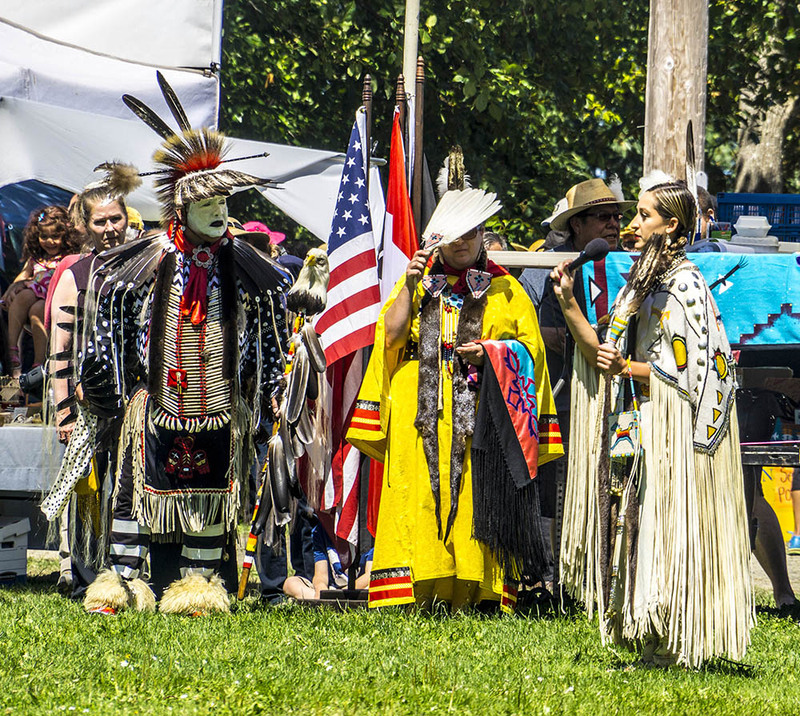 Our friends Emilia and Mario travel the world but had not been to a Pow Wow in Seattle so we took them to a fun day outing at Discovery Park to admire the regalia of traditional Native Americans. I see this kind gentleman every year, he is gracious, kind and instructive in the ways of his ancestors and the traditions that surround his way of life. He should be a diplomat this handsome man has skills in attitude and a kind demeanor. 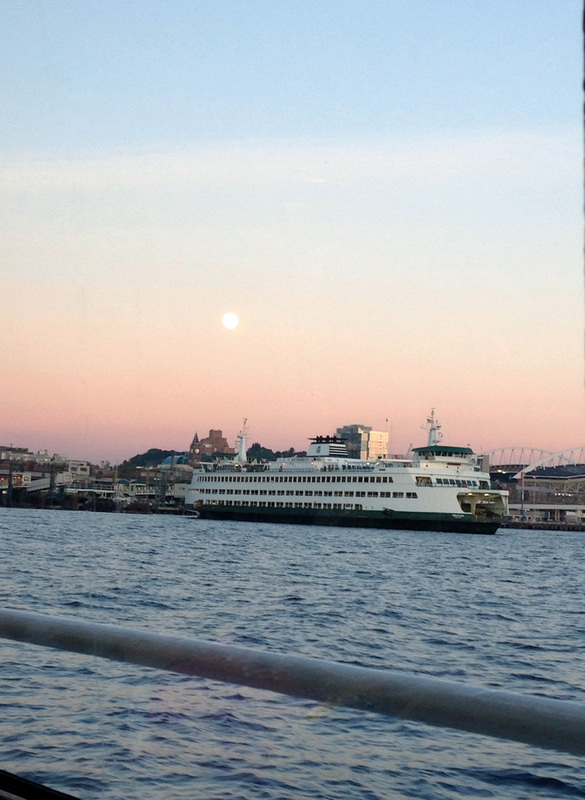 Seattle has lots of opportunities to host our guests to sites of the sound. Lisa and Robert came to visit and we took the ferry to Blake Island.